The advent of another hot summer brings into focus, yet again, the absolute need for the conservation and preservation of one of the most precious of our resources, fresh water, whose scarcity has reached daunting levels. 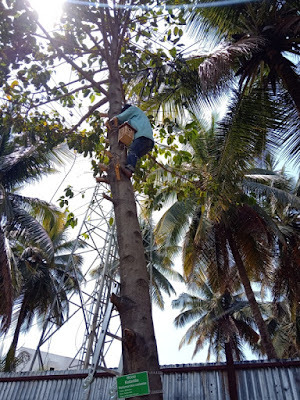 Basic water preservation techniques have become the need of the hour. The life-threatening depletion, pollution and misuse of our fresh water resources do not augur well for future generations. World Water Day, 22 March, has gone beyond the aura of symbolism to that of alarm and ominous warning. Cities around the world have seen citizens' movements to counter the abuse of streams and lakes which are the life blood of fragile ecosystems, and to protect and preserve them. Our beautiful Puttenahalli lake is an example of how we, as a community, can transform a once dying lake into a sparkling life-sustaining one with a rich diversity of flora and fauna. Our heartfelt thanks to all our well wishers, partners, donors and supporters. 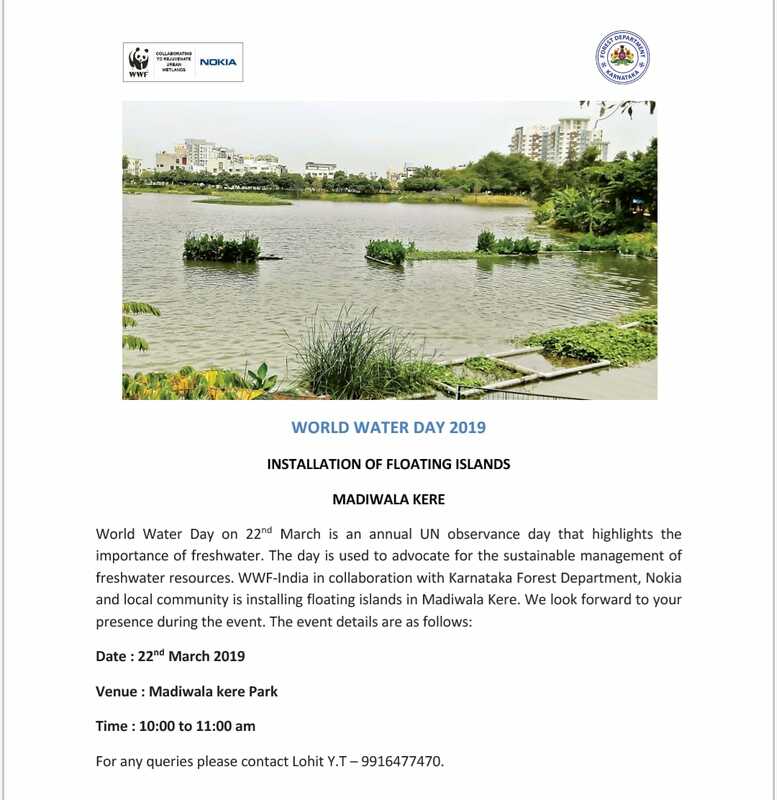 You will be happy to know that our Floating Island concept is the theme of this year's World Water Day celebration at Madiwala Lake. Do attend this event. If you are not able to, then go to our lake. 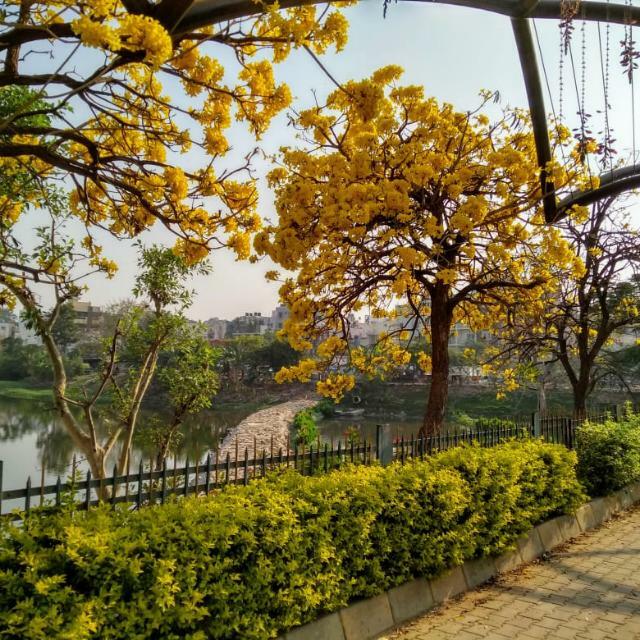 There is no better way to celebrate World Water Day than to spend some time at our pretty neighbourhood lake, a lung-space from the manic, time-bound, work driven city life and connect to where we first came from - water. The "Ides of March," 15th March, is historically important because that was the day Julius Ceasar was assassinated. 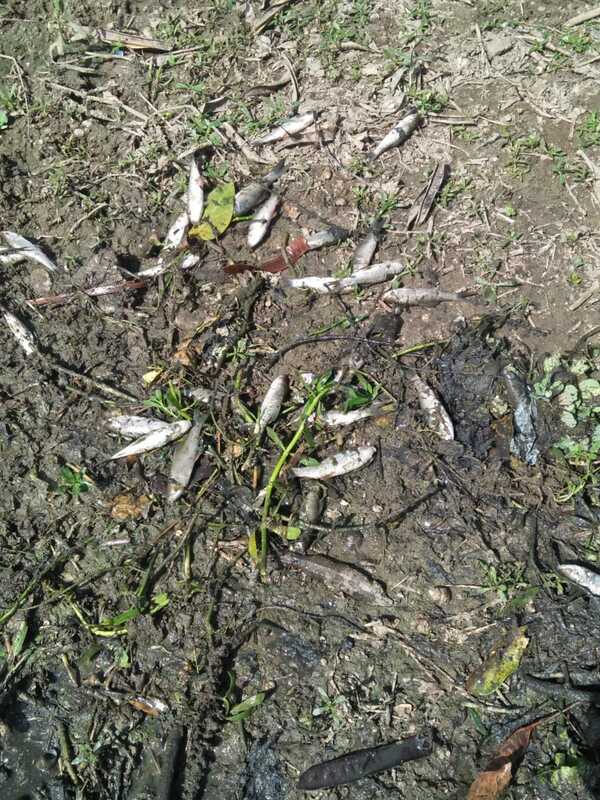 This day became important for us from 2018 because of the heavy downpour that evening which had led to sewage entering the lake and in turn led to a massive fish kill. It was a catastrophe that is imprinted in our minds. We stepped up our effort to improve the quality of the water and are in the process of installing a fountain as aerator. Our alarm bells began to ring when we heard that Yellappa the licensed fisherman at our lake wanted to release fingerlings. In this heat? Will they survive? When the water level is falling drastically and many lakes are almost dry? But perhaps he knew better, we thought, because commercial fishing is his livelihood. Day before yesterday, 12th March, Yellappa's men released fingerlings, a few hundreds, late in the evening. 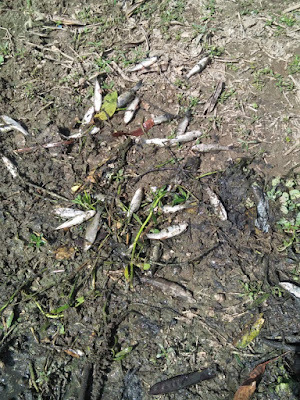 Yesterday morning walkers at the lake called to report that fish was dying at the lake. When questioned, Yellappa coolly replied that it was just a trial. 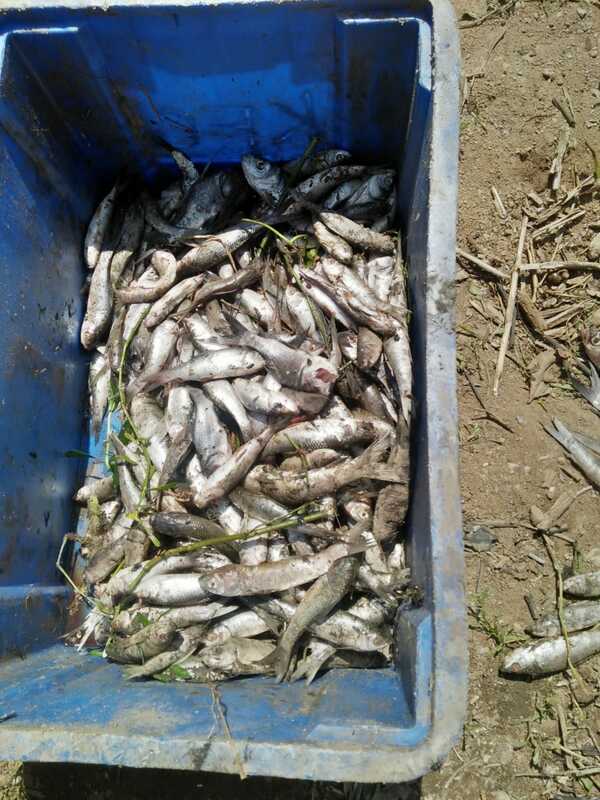 The Fisheries Department had issued an advisory against releasing fingerlings in this period. He had wanted to take a chance and gone against this advisory. 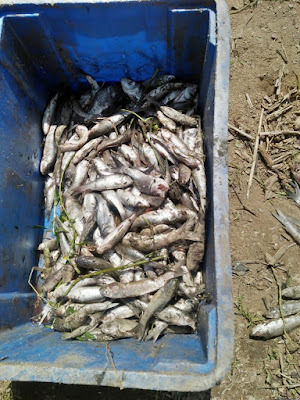 By the time his men came to remove the dead fish, our gardeners could not bear the sight and had taken out more than half a crate of dead fingerlings. Today morning some are still seen floating in the water. Small ones in hundreds. Dead for no fault of theirs. 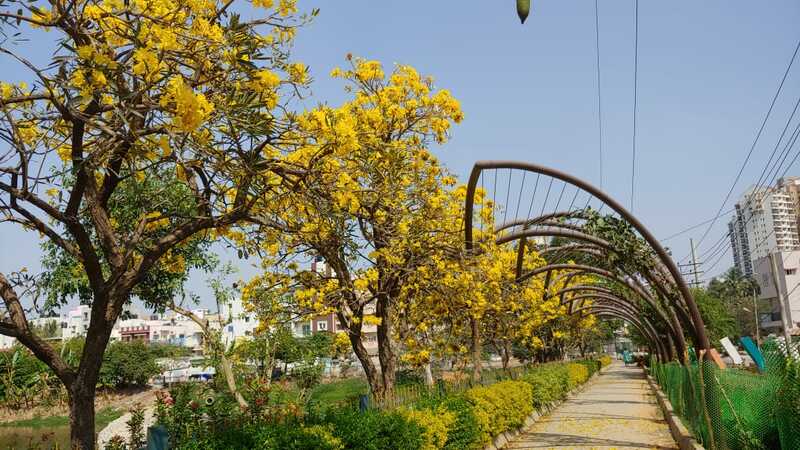 Different parts of the city are aflame with the glorious colours of pink and yellow of the Tabebuia rosea and aurea. Just these two flowers in profusion make our city a very special place to live in. Our lake is not lagging far behind. We have only one pink Tabebuia but the yellow ... ah! It's truly a magnificent sight of a line of the Tabebuia aurea ... a shower of gold indeed! Even if you don't go anywhere else to see the blooms, do visit the lake. These are extra special because they were planted by our residents in July 2010 and because next to these is our pergola on which two of the climbers are flowering as well. Racing to catch up with the yellow Tabebuia are the line of pink Cassia at the Brigade Millennium end. The branches are already loaded with buds. While you are at the lake, do look out for the bird nesting boxes - One each on the Kadamba and Buddha Coconut. We plan to put up a few more. Heartfelt thanks to naturalists Mr. Uday Kumar and Mr. J.N. 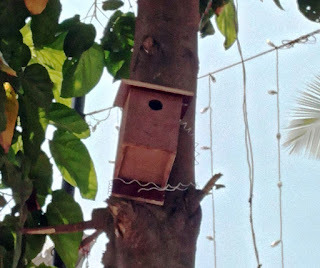 Prasad for donating these nesting boxes. Visit the lake and enjoy the riot of colours! There is no better way to get away from a sterile digital world and into the wonderful elemental world of nature than to spend some time at our neighborhood lake. 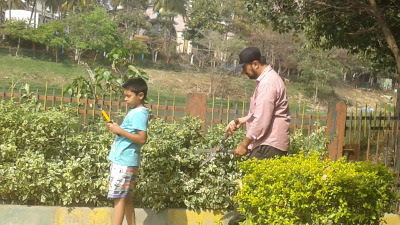 Therefore, the soaring day temperatures did not keep away the 13 odd children and adults from participating in an enjoyable, full-fledged gardening session yesterday morning at the lake. We had a pleasurable two hours of weeding, clipping hedges, shoveling dead leaves and sweeping the walkways clean, all in the backdrop of the sparkling lake. 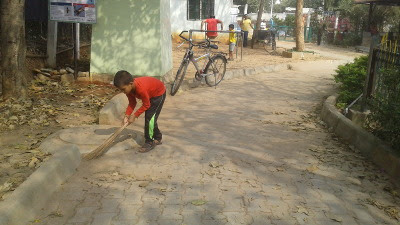 The boundless enthusiasm and energy of the young ones was heartening. One mother who had come with her two young daughters told me: "Nothing can be more healing than this. 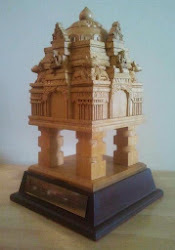 We city people need it." This echoes what the famous naturalist Rachel Carson said- " city dwellers need to find some place to open up the disused channels of sensory perception." I am sure she would recommend Puttenahalli lake! Our next Family Gardening Fun Day will be on April 6th @ 9:30AM. The huge wedding hoardings in our neighbouring marriage convention hall blocked the entrance to our lake from Brigade Millennium side in addition to causing traffic jam right across the gate! We, the PNLIT volunteers were agitated as parents couldn't park their vehicles and had to find a way to bring the children inside the gate. With mercury already rising, it didn't look like a good start to our first theatre workshop that was condyucted on Sunday morning (24th Feb) by Dr. Sonali Sathaye. 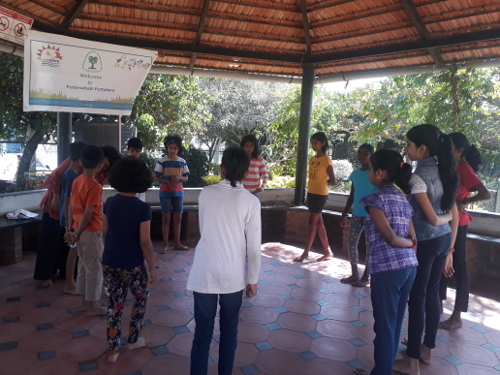 Nature had other plans, the cool breeze from the lake and the shade of our Gazebo and trees calmed things down while Sonali worked her magic on the 16 children who had assembled. The wedding, the traffic jam and their noises faded into the background. 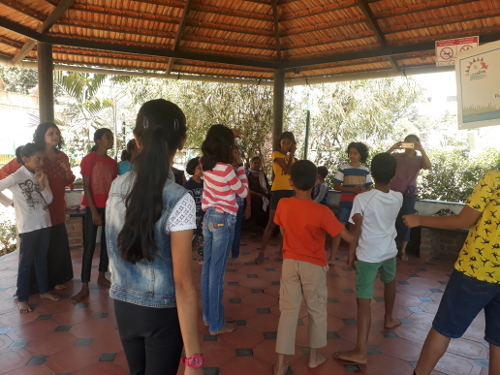 The workshop started with a couple of interesting games as ice breakers which made the children get to know each other. Then came the body movement and vocal exercises which made them alert and aware. Enactment with expressions - exaggerated expressions - made them laugh at each other's silliness. 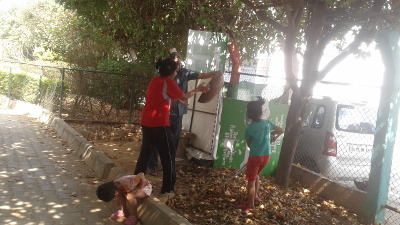 Sonali then made the kids do an interesting exercise of observing any movement in and around the lake and enacting it. Initial hesitancy had given way to openness and the children flapped their hands happily like birds and butterflies, swayed like trees, rowed boats and drove cars! Lastly, teams were made and each was given a short scene to enact (that included the movement and expressions learned earlier), which the audience had to guess. How those two hours flew by, we couldn't say (though the traffic jam and the honks were still going strong!!). The workshop was great fun on the whole. At first, I was nervous. But later, I became more involved. It was fun working in groups. I got to know a lot of people. It was done in a simple yet engaging manner. I am glad I came. 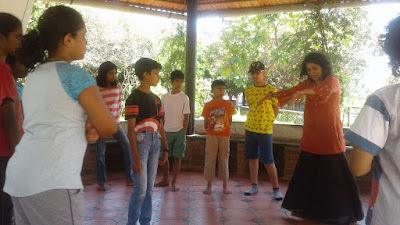 The theatre workshop conducted by Sonali aunty at Puttenahalli Lake was an interesting event. First she made us observe all the living and non- living things in the lake and then told us to act like those things. I learnt to make different types of movements and expressions. She taught us to speak clearly, slowly and loudly. I learnt to be confident and not be shy. I want to attend more events like this at the lake. We look forward to hosting more of such events which connect both children and adults to the natural world around us. A citizens’ fest at The Bohemian House, Richmond Circle is being held on Sunday 17th February 2019. 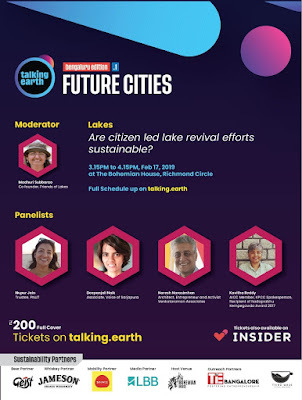 Talking Earth’s Future Cities Edition 1 will have 4 panel discussions, over 30 speakers, 6 workshops, art zones, 20 sustainable brand stalls and much more. 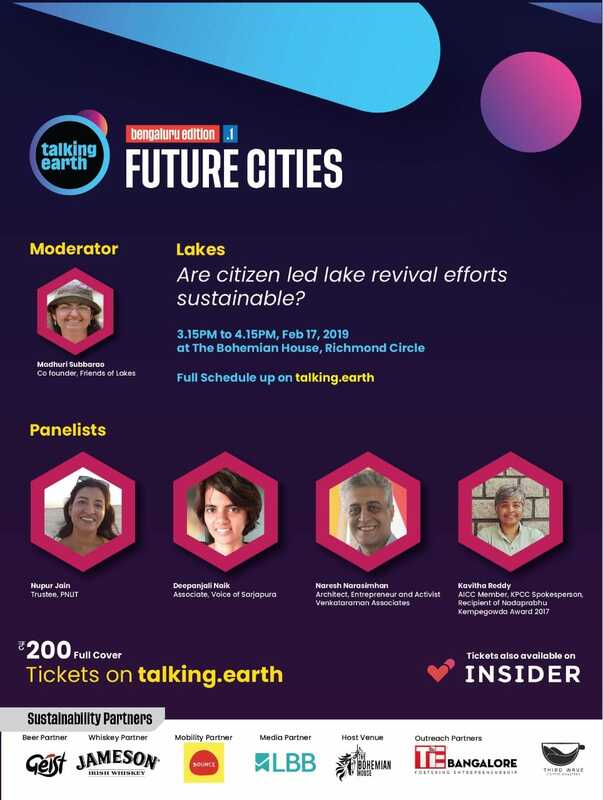 PNLIT Trustee, Nupur Jain will be part of the panel for the discussion on lakes, along with Kavitha Reddy, Naresh V Narasimhan, Deepanjali Naik and moderator Madhuri Subbarao. Topic: Are citizen-led lake revival efforts sustainable? 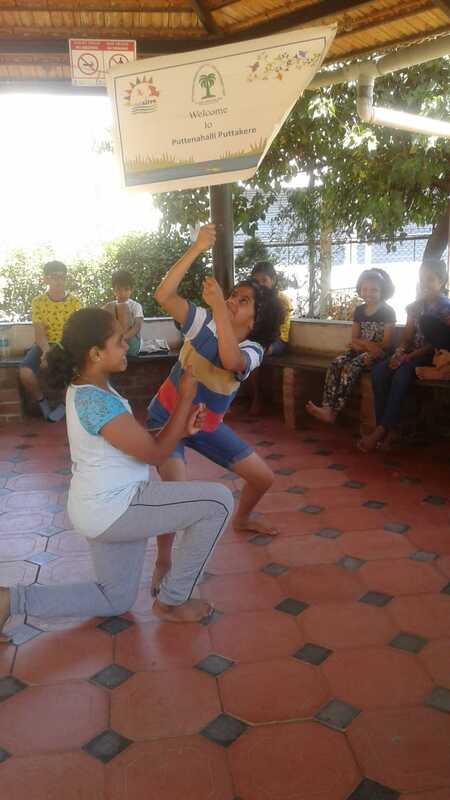 Join us for PNLIT's first theatre workshop for children. A theatre workshop for children aged 10 years and above, will be conducted by Dr Sonali Sathaye. Bring - Your water bottles! This is a FREE event, but you need to register the names as we have limited seats available. To Register - Send a mail to sapana_rawat@yahoo.com or divyadshetty@hotmail.com with the child's name and your apartment community's name/ house address. This workshop focuses on relationships: relationships that the children will observe in the natural world (through direct observation around the lake), relationships between their voices and their bodies, between their bodies and their emotions and, of course, relationships between themselves as they act out little impromptu pieces. Participants should come prepared to be silly, to make lots of noises and voices, not to mention trying out strange walks and expressions! As an anthropologist, Sonali Sathaye sees theatre everywhere, including, most especially in the way we live our social lives. As a theatre practitioner, she seeks to share her enjoyment of this drama with children - so that they too may delight in the absurdity of the everyday. 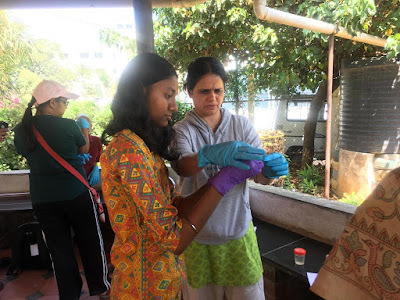 Our first Citizen Science Programme held on 13th February 2019 in collaboration with the Earthwatch Institute India and IISc was a very satisfying one indeed. 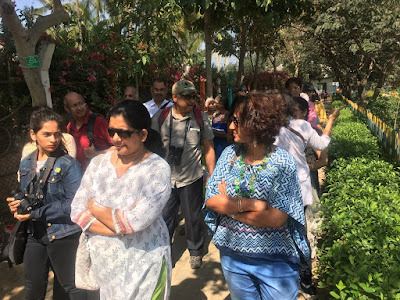 We had less than our target of 30 participants, but all of them were deeply engrossed in the Nature walk led by veteran bird watcher and educator, Mr. J. N. Prasad which was followed by a session on water conducted by two researchers from IISc. Given below are reports by two participants. On the 13th of February, 2019, the Puttenahalli Neighbourhood Lake Improvement Trust organised a Citizen Science Programme for the community with the objective of increasing environmental awareness, primarily with regards to the lake and its surrounding flora and fauna. The event began with a nature walk around the lake, led by Mr. J. N. Prasad who informed the participants about the avian diversity of the lake and its surrounding neighbourhood. Participants had the opportunity to learn about the habits of birds such as the egret and the purple swamp hen, refute myths about the mynas and discuss pigeon population problems. Following the walk, Lepakshi Raju and Harini Santhanam of the Indian Institute Of Science along with Surbhi Sharma from Earthwatch Institute India conducted tests on the lake water, checking for parameters such as pH level and conductivity of the water and then allowed participants to do the same. They also educated participants on how to check the nitrate and phosphate levels of the water. Following this, the two researchers from the Indian Institute Of Science handed out questionnaires for their survey regarding the attitudes of the common public towards lakes and their maintenance. 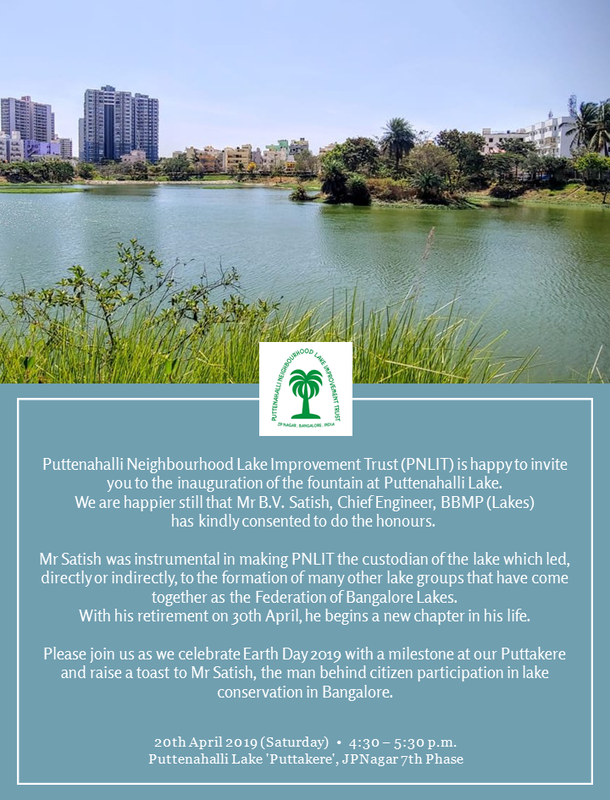 This repeated and continuous effort by the PNLIT has been a major help in raising awareness about the unfavourable treatment of lakes in and around the city. 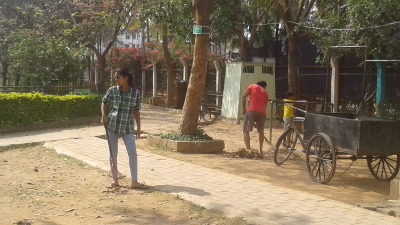 The Puttenahalli Lake, in particular, has benefitted from their proactive contributions. 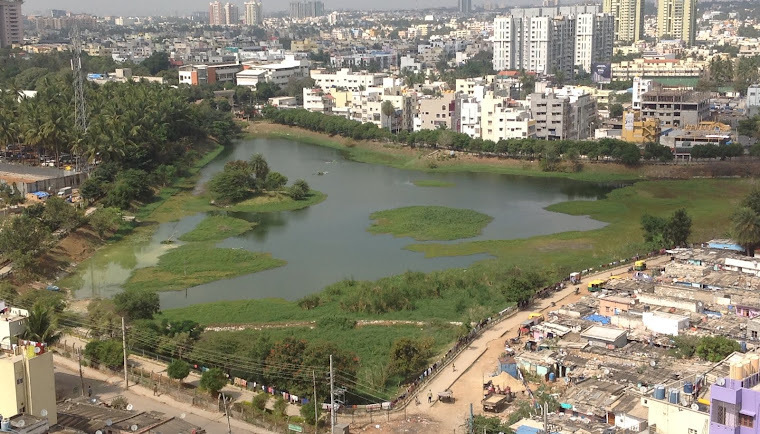 They have been vital benefactors to Bangalore’s lake saving movement and one can only hope that their endeavours will continue to rub off on the citizens of this city, making them more aware of the way they can also do their part. 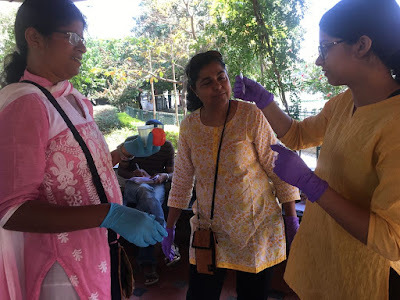 The well-attended Citizens Science Programme, held on the 13th of February, at the Puttenahalli lake premises was a pleasurable morning at our pretty neighbourhood lake with a principal thrust towards spreading awareness in the community of conserving and preserving our valuable city lakes. 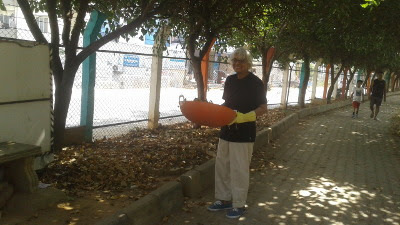 It was led by a well- anchored team of researchers form IISc and Earth Watch India, JN Prasad (a well-known naturalist) and head of PNLIT, Usha Rajagopalan. 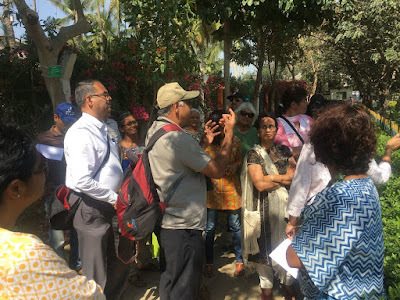 Usha Rajagopalan began with an immersive talk on the history of the decade long persistence and commitment put by her team to save the dying lake. This was categorised by a display of photographs taken at different times of the lake’s passage. 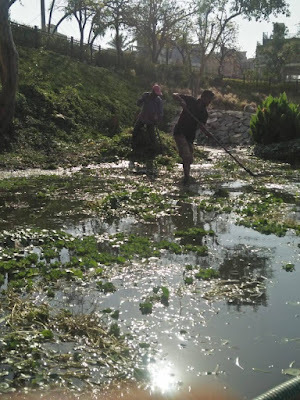 She spoke of the cleaning of the lake bed, the technicalities involved in channelling the rain and ground water into the lake, the planting of water purifying aquatic plants, the engineering of floating islands to improve water quality and provide bio-diversity habitat and the replenishing of the lake by treated water from the apartment complex. Her talk had a crucial underlying message - the sustenance and preservation of the lake rests on the shoulders of the local community. Then, JN Prasad, the birder, took us on a languid walk and into the magical world of birds - the hundreds of rushing swallows high in the sky, who had arrived from Europe, the magnificent Brahminy kites swooping low, a sedentary grey heron perched on an island, the territorial common coot, the cormorant’s fishing skills, the white egrets whose feathers had once donned ladies' hats. 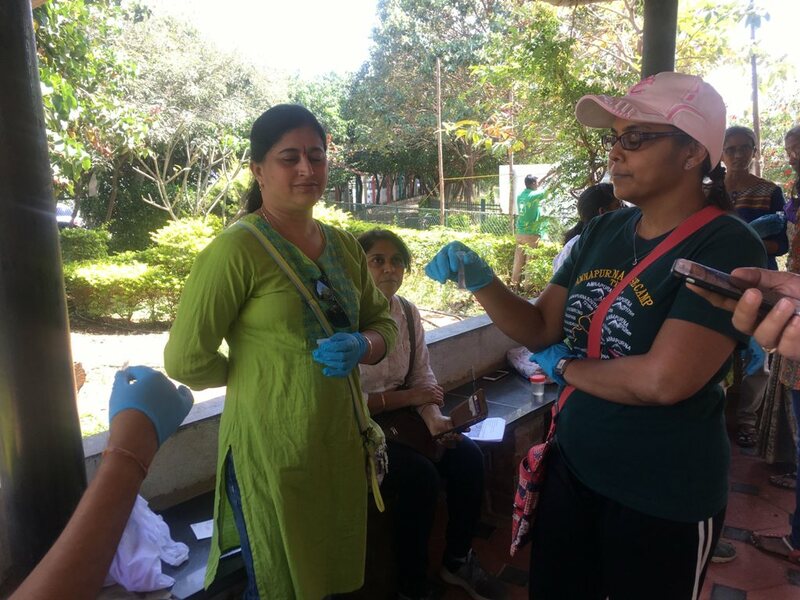 Finally, after a refreshing tea break, we had a presentation by the researchers of Earthwatch India and IISc, followed by the testing of the lake water with the active participation of the attendees. The parameters included the pH level, the acidity and nitrogen content and turbidity. When the results were out there was jubilation! The water in our Puttenahalli Lake was “good”! After more pleasant reflections and deliberations we dispersed after a well-spent morning. We hope to have more such experiential learning events for residents in the future.